While Middlesbrough are busy preparing for their play-off semi-final, we've ran the numbers to see how far Tony Pulis' side might progress. A 2-2 draw at Ipswich Town last weekend secured a 5th place finish for Boro and set up a semi-final tie against Aston Villa. Pulis' side welcome the Villans to the Riverside Stadium tonight (kick-off 5:15pm) as they aim to bounce back to the Premier League at the first opportunity. A trip to Wembley awaits for the victors of the two-legged affair with the Teessiders making the journey to Birmingham on Tuesday evening. But how does history suggest Middlesbrough will fare in the play-offs? We've looked at the second tier play-offs since the turn of the millennium to see what stage sides finishing in 5th place tend to reach. And unfortunately for Boro fans, it doesn't make for particularly pleasant reading. 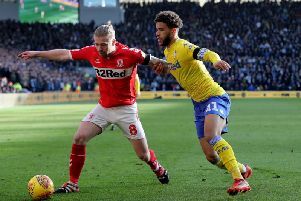 47% of the teams who have finished fifth have been knocked out of the competition at the semi-final stage - by far the most common result for teams finishing in Boro's position. That does mean though, that over half of the sides who finish 5th do reach the final. But only five of those teams have ultimately sealed promotion, including Huddersfield Town who were victorious in the Championship play-offs last season. Crystal Palace, Burnley, Wolves and Birmingham are the only other sides to have gained promotion after finishing fifth since 2000. Perhaps unsurprisingly, teams finishing 3rd have been most successful in the play-offs with seven of the last seventeen winners having occupied that spot. So a trip to the national stadium could be on the cards for Middlesbrough - but the stats suggest that there might not be an immediate return to the top flight.